The Build 2015 conference has just taken place in San Francisco. Like last year, this has been another huge event for Microsoft, and a big deal for the people who build solutions using their technologies. The future of .NET is the continued push to an open source .NET Core, which is at the centre of both the latest ASP.NET runtime and the Universal Windows app platform. In the future, this will expand and include other application types. In my opinion, they’ve picked the right place to start. Applications running on the CoreCLR can be developed and deployed on cloud and server-based infrastructures running different operating systems including Windows, Linux and OS X. I have been watching the development efforts on GitHub for a while now, and I’ve set it up on my own machines running both Windows and Linux. It sure is a sight to see. As well as the core runtime itself going open source, other technologies like Roslyn have enabled products that many wouldn’t have guessed would see the light of day. Having an open source compiler platform has enabled Visual Studio Code – a new cross platform text editor with Intellisense – to be built. 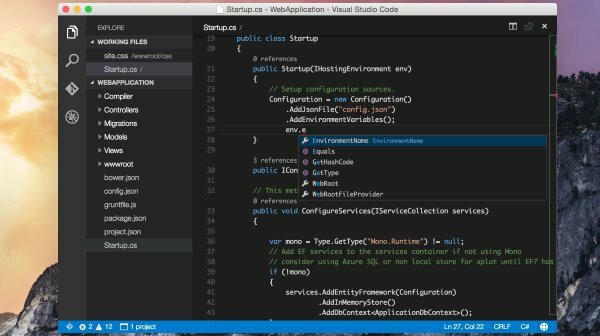 I was lucky enough to see Visual Studio Code before it was announced, and it changed the way I thought about collaboration with Mac users instantly. I’ll have more on this new text editor soon. With the RC of Visual Studio 2015 there have been some big improvements in the languages supported including both the more traditional C# and Visual Basic, and (my personal favourite) F#. The Visual F# improvements in ‘every day’ activities are dramatic for anyone who has been using the language. This is all thanks to the new open source attitude, and the amazing community around F# who have helped to develop the Visual F# tools on GitHub. This new world of cross-platform and open source .NET technology is going to enable some amazing scenarios for .NET developers like myself. The aforementioned Universal Windows app platform is really taking shape now. Gone are the days of very prescriptive (and maybe too forward-looking) design patterns of Windows 8, and in is the ‘do what’s right for your applications‘ model that has been working well for some for a while. Universal Windows apps scale from the smallest phones and Internet of Things devices up to the large screens of the Xbox One and the Surface Hub. The most ‘universal’ of these apps are built with just one binary which includes a scalable UI. This allows you to even have the ‘desktop’ app experience when used on a landscape 5.7 inch phone, or when plugged into an external screen using an amazing new Continuum for Phones feature. For app developers there are some interesting (and controversial) new ways for software venders to build for Windows. The biggest of which are the bridges from Android and iOS. These two are extremely important for the phone and work especially well for iOS games which don’t rely too heavily on the operating specific UI elements. Combined with the bridges for ‘classic windows’ apps and websites using Microsoft Edge, the Store should get a lot more apps on this Windows 10 wave of releases. From a user’s view, Windows 10 has really rounded out, with the latest Insider Preview feeling a lot more polished than any of the previous builds. Seeing HoloLens run standard Windows Universal apps was a big deal too. I’ll have more thoughts on these in the future as the Insider Preview continues, and more information for HoloLoens is released at E3. Azure, and the Microsoft Cloud in general, continue to amaze me. Microsoft has managed to embrace this new way of building (and selling) software in at breakneck speed. Additional services were added throughout the platform all the way from storage and networking, to analytics and machine learning. Way too many for this article. Two of the biggest highlights were the ability to run the complete Azure Stack locally, and Azure’s new Data Lake features too, something which Amazon has had a lot of success with. For me though, the most interesting changes were around Docker support across Windows and Azure. 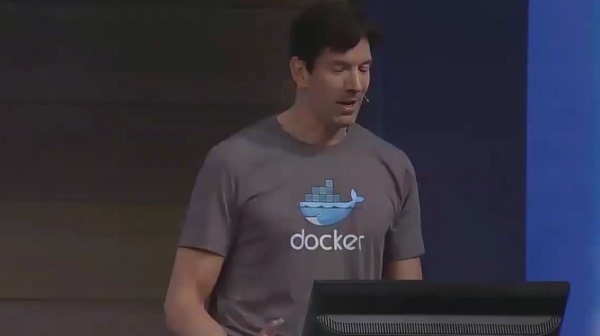 Docker has been on my radar for a while, but I have yet to use it in production. I have plans to do so in the not too distant future.